WHO: Just a few of my favourite girls off of the internet and bestest friends. 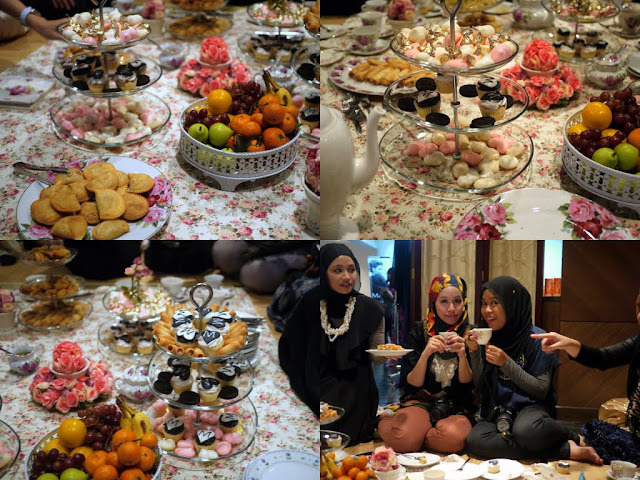 WHAT: A girls only Tea Party at the wonderful Blush & Brush salon. 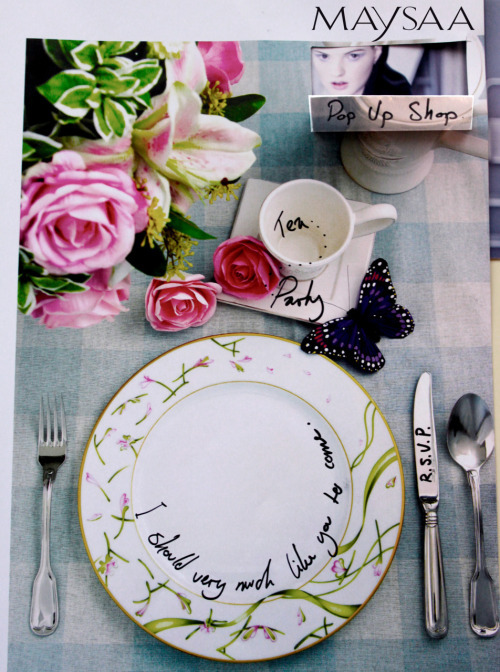 Time for tea and cake and party games, like us English folk do. A Maysaa London private pop-up shop open exclusively for you important girlies. Have a first hand preview of the new collection. Plus pictures and as many wonderfully frivolous ideas as I can come up with. It all began when Hana announced on twitter & facebook asking for everyone's blog links for a lil something something she said. I remember that there were hundreds of people who gave her their blog links. I sent Hana a direct message on twitter saying I was interested and bless her she said she already has me on her list(!) & wants all the Scarflets to be on board as well. I was truly surprised that I have been chosen! And the fact that she even knows the existence of our lil Scarflet sisterhood ♥ My heart could've exploded with fireworks at that very moment (cue Katy Perry - Fireworks). After we worked on the date where everyone was available, we anticipated the moment for the official invite & the above was sent in our email. Jittery nervousness and immensely ecstatic for the anticipated day. 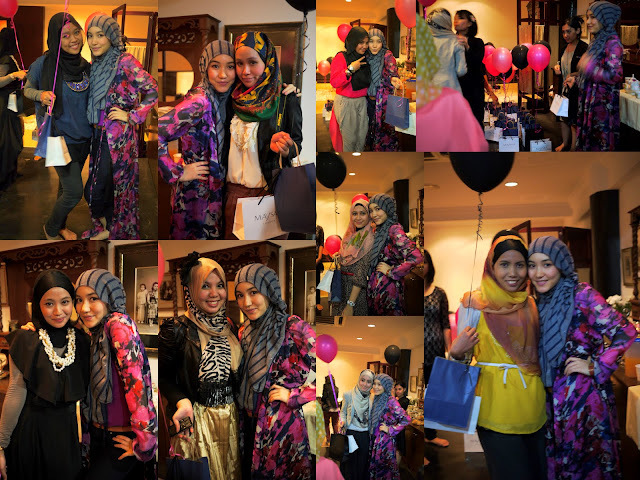 Was lucky that I met Aimie, Sha & Fatin a day before at Sue Anna Joe's lil Sheriff Luqman's birthday. Atleast my nervousness to confront these beautiful ladies is lessen. 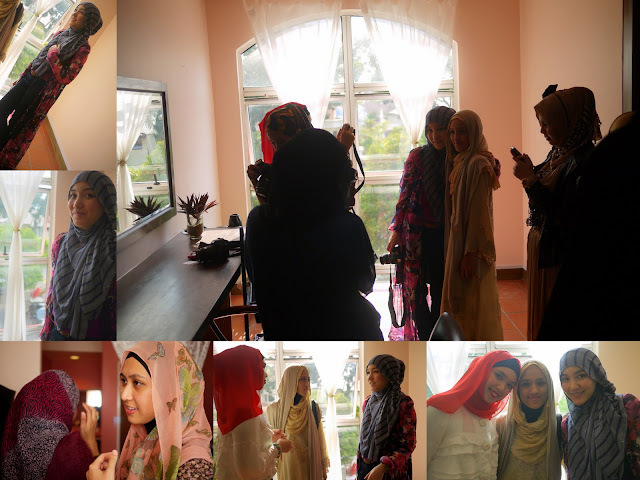 But to meet Hana Tajima again! Well, I knew I had to brush up on my spoken English or else! 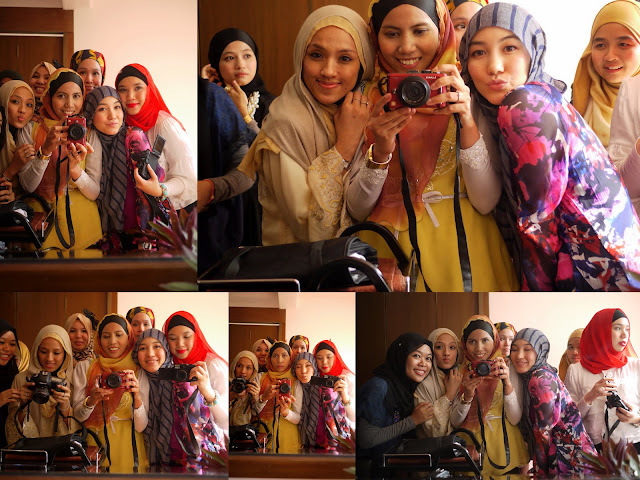 Chatting & laughing and taking pictures almost every single moment - what else there is to do when girls get together? 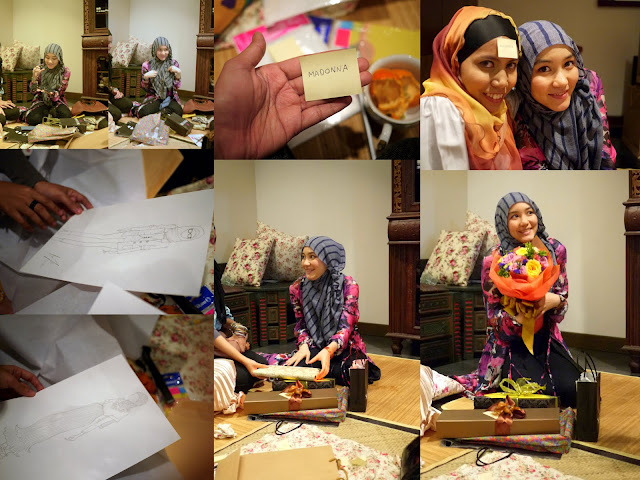 And one thing that I got to know from Hana was that she cared for her late sister-in-law for a year during her final year of living, her sister-in-law passed away due to Leukemia. Instantly I feel connected to this lady coz she probably know what I have been through :").. Al-Fatihah for Hana's sister-in-law; may Allah bless her soul.. After sipping teas & munching cuppies, everyone was getting itchy to take photos with Hana and so we moved to the salon area for better lighting! 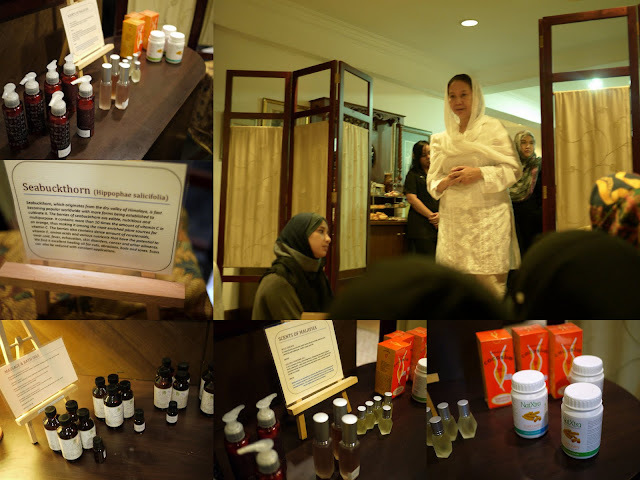 And then afterwards, we move back inside to hear a very informative talk given by the owner of Rumah Tanjung herself, Datik Nik Radhiah about the products & services that they have. One that attracted me the most is the dietary supplement that they brought in from Germany/U.S was proven effective for cancer patients. One patient took it to during her chemotherapy and it helped heightened her immune system therefore less dosage of chemotherapy needed to be given. I was privileged enough to had a one on one chat with Datin and she even told me that one patient who had a brain tumor took the Curcumin supplement and the tumor distinctively got smaller. Interesting infos aye? I'll write more once I get my hands on a CD she plans on giving me. We shopped Maysaa, 20% off y'all! Wished I had gotten my hand on the kimono wrap dress :'(((( Sparingly, one by one we were called for a short video interview by IkanPaos Collective - Hana's video guy. Luckily I had my interview with Aishah Amin, so I was less jittery. Except that I made a mistake of pronouncing chic as chick when it should be sheek. I really hope he edits it out! Afterwards we gathered again and played the Guessing Game. I sat next to Hana and she tagged me as Madonna, took me 5-6 questions to get it right, but Maria gave it away by saying the keyword leotard muehehe :P After the game, we had Hana open all the presents we gave her. We really do hope she love all the presents, I picked out a Mango/MNG necklace for her. Hope I made the right choice. Alas, time passed by and it was time to go home. Everyone was reluctant & wanted to stay & linger more.. Hana & team gave us a two goodie bags, one from Rumah Tanjung & one from Maysaa and a pink/black helium balloon! I now have two Maysaa goodie bags in my closet, each time I open my closet everyday I see 'em :') As much as we don't want to, we said our final goodbyes to Hana and her team and to eachother. 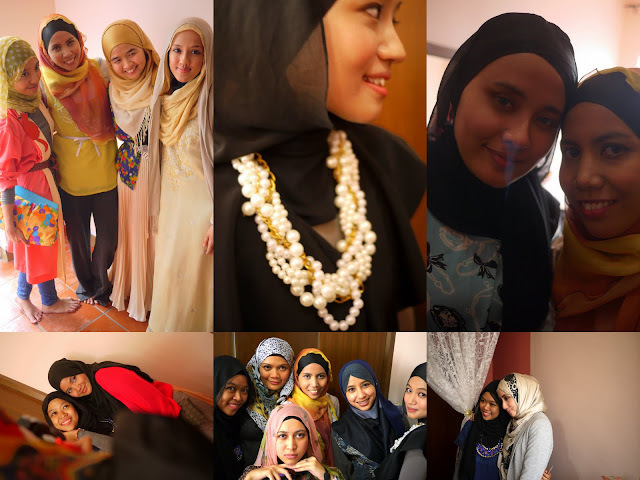 p/s: Details of what I wore to the event is here. all hail ami the blogger! !